The fourth swarm sprint consists of two topics areas: developing synthetic technologies in the OFFSET virtual environments and identifying applications of artificial intelligence (AI) to discover and learn novel swarm tactics. 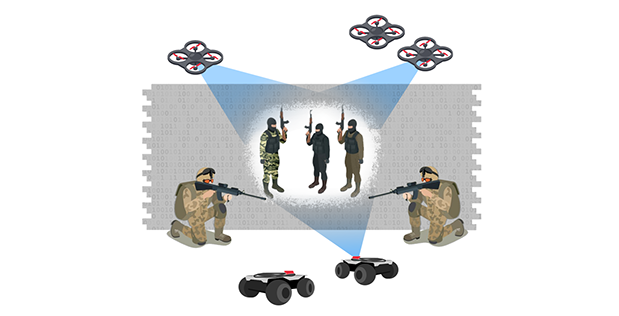 For the first topic area, proposers will seek to develop and implement synthetic capabilities in simulation, representing potential future technologies, such as distributed “see-through-wall” sensors, passive swarm communications, or enhanced sensor/computing arrays, to enable and demonstrate novel swarm tactics. Proposed technologies could be near-term advances that are being prototyped in laboratories or far-term ideas that are primarily conceptual but physically grounded. The second topic area represents an ad hoc sprint for leveraging artificial Intelligence for accelerating swarm tactics design, for which sprinters will discover, learn, and harden novel swarm tactics by applying artificial intelligence frameworks via enhancements of the OFFSET virtual environments. 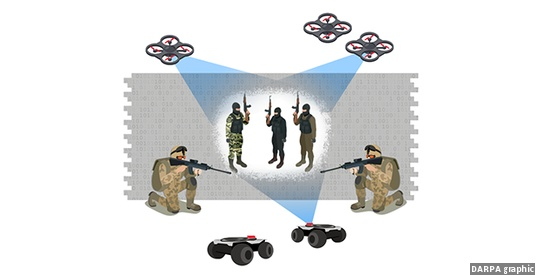 OFFSET envisions swarms of 250 collaborative autonomous systems providing critical capabilities to ground units in urban areas where challenges such as tall buildings, tight spaces, and limited sight lines constrain essential communications, sensing, maneuverability, and autonomous operations. The swarm sprints aim to encourage rapid innovation and continuous incorporation of breakthrough technologies. Each of the five core sprints emphasizes one of the key OFFSET thrust areas – swarm tactics, swarm autonomy, human-swarm teaming, virtual environment, and physical testbed – to ultimately enable cross-cutting breakthroughs in swarm systems capabilities. DARPA also has awarded separate contracts for the third swarm sprint to Carnegie Mellon University and Soar Technology Inc., each of which will focus on development of advanced swarm tactics. The third swarm sprint aims to augment the growing collection of swarm tactics in the OFFSET ecosystem, employing heterogeneous swarms of air and ground robots, and also to explore innovative technologies to enhance human-swarm teaming or how humans interact with autonomous swarms. Proposers may submit to one or both of the topic areas for the fourth swarm sprint. Full OFFSET program details are available on the Federal Business Opportunities website: https://go.usa.gov/xRhPC, with directions to submit to this solicitation available under Amendment 5. Proposals are due by 1 p.m. EDT May 1, 2019. Please email questions to OFFSET@darpa.mil.